I’ve never met a fluffier, more perfect pancake! These homemade sour cream pancakes are an indulgence – so delicious and incredibly quick to whip up! Thank you so much for all of your kind words on Friday’s post! I don’t mean this lightly: I really do feel like I have the best blog readers on the planet. You truly are the reason I don’t need many friends in real life (totally weird, but true), the reason I actually like the internet, and the reason why I continue to take pictures of my food and share them with you nearly a decade later. I had a great birthday. Super low key, just the way I like it. Brian usually makes a birthday dinner for me (a little stressful for both of us, not going to lie), but for the first time in our whole career as parents, we took the family out to eat for my birthday. Hilariously, we realized why we usually avoid doing this as my 8-year old kept shouting in the booth of the fairly nice restaurant we were at: “is this fast food? cause it’s taking a waaaaay long time to get our food” while his slightly older brother kept insisting that nothing beats McDonald’s cheeseburgers. Nothing. I was never more relieved to get home and devour my portion of the Double Chocolate Mousse Torte. Let’s talk about these pancakes. Oh, we love them. They are a highly requested breakfast and a bit of an indulgence (coming from a mom who loves to get in all the whole grains she can whenever she can and however she can). So light and so fluffy, they are what every pancake aspires to be (and if they don’t, they are what I would call a pancake underachiever). My kids know immediately when sour cream pancakes are happening. They can tell just by looking at the griddle and seeing the light-colored batter sizzle into perfectly golden pancakes. They hoot and holler and give big hugs and shout all sorts of exclamations about how I’m the best mom ever and they’ll never be mean to each other again (?!?) and they only want to eat pancakes, sour cream pancakes, for the rest of their lives. We love them. All of them. 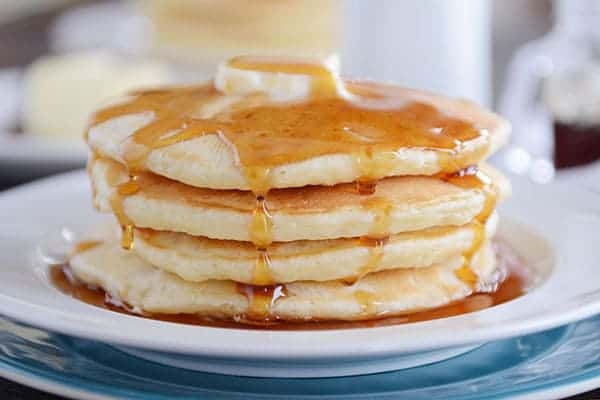 But there is something special about these sour cream pancakes, and no matter how delicious, the other recipes don’t get quite the same reaction as these delectable, fluffy pancakes. We often make these pancakes for company passing through town (which happens a lot as we are the middle stopping point for six of Brian’s siblings in Utah when traveling to see his parents in Oregon and vice versa; it’s awesome). And these sour cream pancakes have become a go-to breakfast on weekends and for special occasions (like birthdays…and they’ll be happening tomorrow for Valentine’s Day breakfast!). 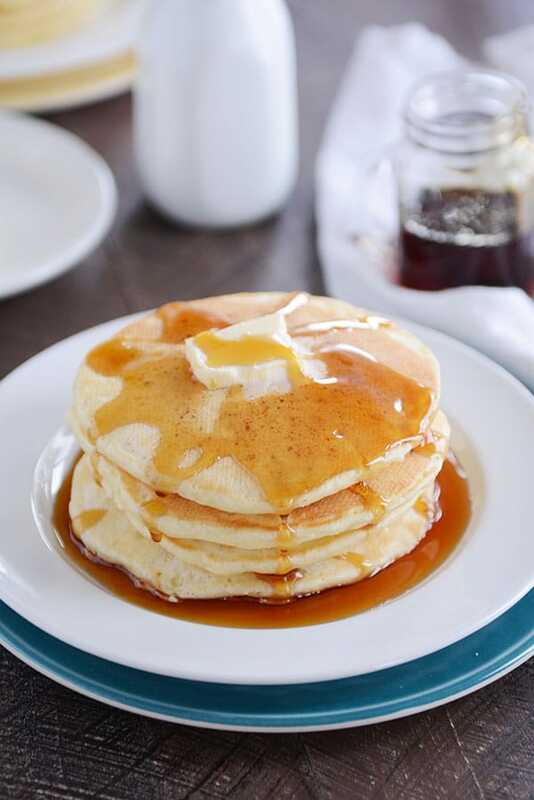 The homemade batter takes just minutes to whisk together, and since pancake better benefits from the least amount of stirring possible, this means less prep time for you! 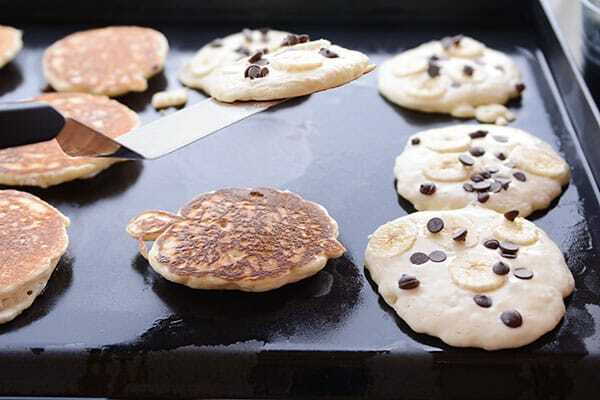 One of our favorite ways to make these pancakes (which I learned from the Camp Chef retreat at Bear Lake last year) is to slice a banana and sprinkle chocolate chips on the uncooked side of the pancake. Flip that baby over to finish cooking, and you have the most delicious pancake ever filled with soft, creamy bananas and melty chocolate chips. Ridiculous. In a good way. You can top the pancakes (banana version or just the good old-fashioned classic pancakes) with a multitude of different offerings (flavored syrups, berries, cream, buttermilk syrup). 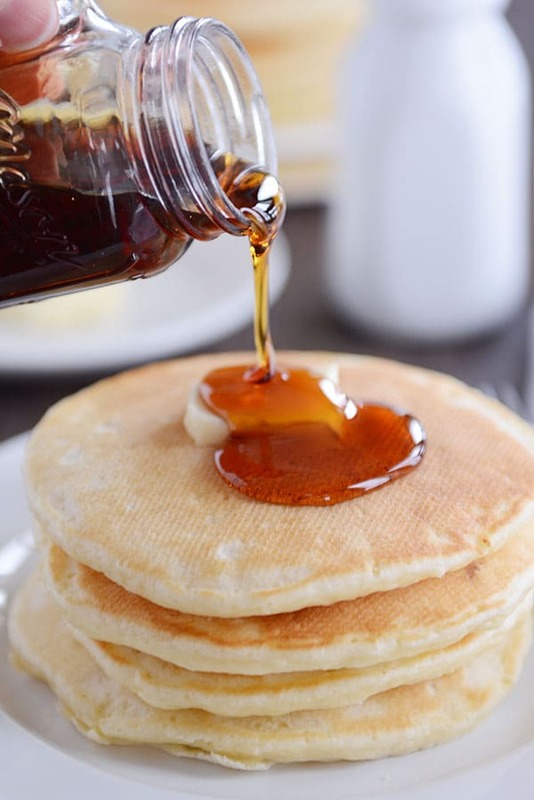 But 99% of the time we keep it simple with butter and maple syrup. I use everything from this homemade maple syrup to pure maple syrup (usually buy at Costco) to this “healthier” (relative term, I know) brand of storebought maple syrup (cheapest at Walmart when Amazon’s price goes up). A quick note about griddles: I’ve talked before about my favorite griddle that I’ve had for years. This 22-inch Presto griddle. It does leave little grid marks on the pancakes based on the surface material; certainly not a deal breaker, but worth noting. Both are fabulous as far as nonstick griddles go. You can also use a nonstick skillet or cast iron pan on the stovetop, too, especially if you are making the pancakes for a smaller crowd. Ok, enough talking! 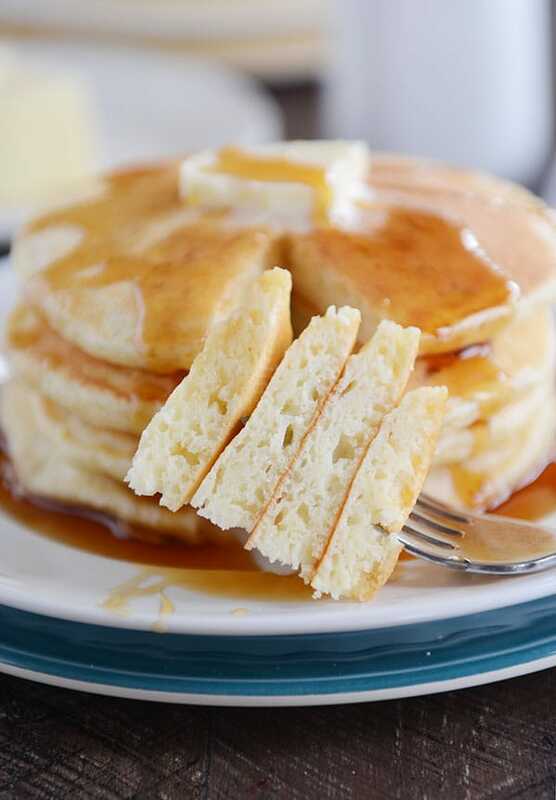 Make a plan to get these sour cream pancakes on your plate (and into your tummy) as soon as possible. You won’t be sorry! In a separate bowl, whisk together the sour cream, milk, eggs and butter. Add the wet ingredients to the dry and mix with a spoon or spatula until just combined. The batter will be lumpy and it's ok if there are even a few streaks of flour here and there. Don't overmix! The key to light and fluffy pancakes is mixing just until combined. Let the batter rest while prepping the griddle. Heat a nonstick griddle to medium for 1-2 minutes until a drop of water sizzles (about 300 degrees F on my griddle, but every griddle will be a bit different). Pour batter into rounds on the preheated griddle (I use my #20 cookie scoop to portion out the batter which holds about 3-4 tablespoons). Cook until small bubbles appear on the surface and the edges are set, 1-3 minutes, depending on the heat of the griddle. Flip the pancakes and cook for another minute or so until golden and cooked through. Repeat with remaining batter. Serve immediately or keep warm in a 175 degree F oven for 15-20 minutes. As written, these pancakes are an indulgence. Light and fluffy, especially with the all-purpose flour (I always use unbleached flour) instead of whole wheat flour. However, I have subbed half whole wheat flour before with pretty good results (not quite as light and fluffy but still delicious). Measure with a light hand if using whole wheat flour and consider decreasing by a few tablespoons and adding more as needed. 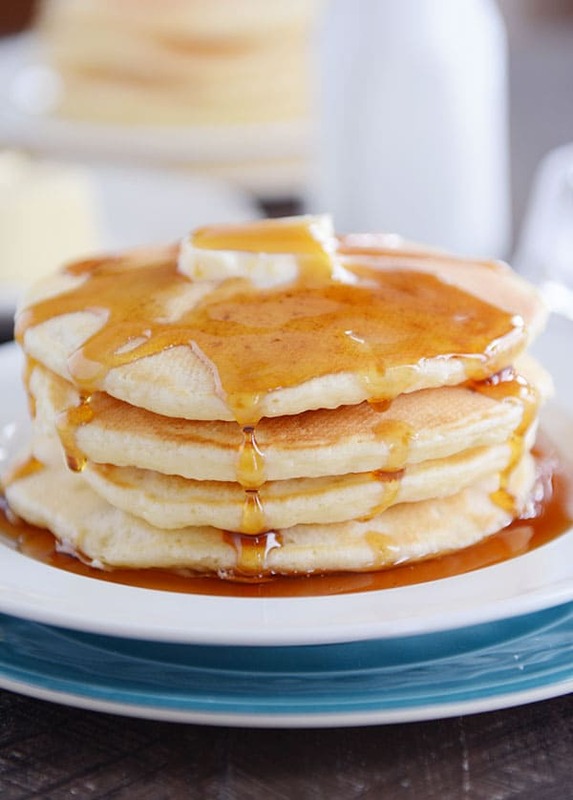 Whole wheat flour absorbs more liquid than all-purpose flour and you don't want the pancake batter too thick which will lead to dense, dry pancakes. In place of melted butter, you could try subbing in oil. The butter gives the pancakes a bit more flavor, but it's certainly not a deal breaker to use oil. I always cook pancakes on a nonstick griddle (had this one for years and now have this larger one) but you could use a nonstick skillet or cast iron pan on the stove. In case you are wondering, buttermilk subs great for the sour cream + milk (might need a few more tablespoons of buttermilk for the batter to be the right consistency). I've even used home-cultured kefir in place of the sour cream + milk - it works pretty well, but like most "baked" goods using kefir, the pancakes are a little more fragile and tender and not quite as sturdy. The way the recipe is written below (with sour cream) is our standard way of making them. Disclaimer: this post contains a few Amazon affiliate links for products I’ve bought there. OH MY GOD. What have you done. Now I have to make this pancake at least once a week. This is it. This is THE pancake recipe. Thank you so much for sharing this – you are amazing!!! I’ve made these twice. They are a lovely texture and fluffy, but for some reason they have an eggy taste to me. It’s subtle and no one else in my family seems to notice, but I’m not a fan of that background taste. This is definitely my new favorite pancake recipe. I’m going to have to start stocking sour cream in my fridge from now on. I have had strange results with supposedly great pancake recipes, but this one cannot be improved upon in my opinion! Today I had to sub 1/2 c Greek yogurt because I only had 1 c of sour cream and it worked like a charm. Glad you are loving this one, Megan! I made these yesterday and they were amazing! I’ve tried other sour cream pancake recipes, and I’m definitely going to stick with this one! We have a mini-farm with 12 chickens and a 30ft garden. Maybe it was the farm fresh eggs that made it taste so good, but nothing beats this one. This is definitely a keeper! Thank you so much for sharing your recipes! If I don’t want to make the whole batch can I keep the batter in the fridge? I think so – I haven’t tried that, though. You could cut the recipe in half OR make the full batch and freeze the cooked pancakes to reheat later. Made these as a waffle batter with fresh strawberries and whipped cream, it was out of this world!!!! Mel, Mel, Mel. Every time you post a pancake recipe, I think, “This is it! I’ve found the One. I’ll never find a better one!” And these are no exception. I used a can of coconut milk and milk, and subbed full-fat plain yogurt for the sour cream. I added the sliced bananas and chocolate chips like you suggested and a little sprinkle of unsweetened coconut flakes. A-MAZE-ing. Did not need syrup (but used it anyway #habit)! I made these for my family for “breakfast for dinner” last night and they were a hit. We had the left-overs for breakfast this morning and they were just as yummy! Thanks for another great recipe! Wow, this recipe was so easy & the pancakes were awesome, light & fluffy. Delicious! Never making boxed mix again. Made these tonight. I used half low fat sour cream and half regular. 1% milk. I doubled the recipe and used 2 cups whole wheat flour and 1 cup wheat germ and 3 cups regular all purpose flour. They turned out great. Thick, great flavour. Yes, I think low fat will work ok.
Holy guacamole. These pancakes are magical. I was out of sour cream, but the troops were starved and I had a hankering for “breakfast for dinner,” so I subbed in plain Greek yogurt with great results. I loved that I didn’t have to use one iota of butter/oil to cook them (maybe it has to do with the 6 T in the recipe…). They tasted amaaaaazing—sweet and rich, yet light and fluffy—and smelled heavenly! I think I’ll sneak in a teaspoon or two of vanilla next time—although it’s pretty impossible to improve upon perfection. Thanks for another delicious recipe, Mel! These Sour Cream Pancakes are going in the regular rotation for sure! I’ve been making pancakes for most of my life and these were the most delicious pancakes that I’ve ever made! Scrumptious and very simple and we even added 1 cup of wheat flour. Next time, I will definitely need to double the recipe. Merci! Best pancakes I’ve ever had! I used 1/2 wheat flour & 1/2 white & my kids didn’t even notice. They loved the pancakes. Thanks Mel! Excellent, made these for our grandchildren this morning, big success! These are DELICIOUS! I was out of milk so I was looking for a pancake recipe I could make without it. I subbed water for the milk (followed the recipe otherwise) and they turned out beautifully. And they’re very filling! I doubled the recipe for my family of 8, and there will be lots of leftovers. Thank you! My husband has been telling me how much he hates pancakes for the entire 6 years we have been married. I made these pancakes for dinner tonight and he couldn’t stop talking about how deliciously fluffy they were! #score Thanks, Mel, for another great recipe! My 20 year old son made this recipe yesterday morning for us, mostly for his dad who was home from work after a wound to his foot had him to the ER the night before. My son has Asperger’s and is taking learning to cook and bake with extreme earnestness and diligence and love. Since my husband couldn’t drive, (I am disabled and can’t drive anymore either) and I had used up most of the AP flour the night before, we only had self rising flour, so my son was thought he would try that and not use any other leaving agents, of course. 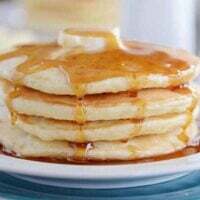 These were such beautiful, excellent pancakes, better than the recipe we have used for buttermilk pancakes for decades now, so fluffy and light, and yet filling enough for my two men. I can’t wait to make a strawberry or blueberry syrup for them. And I especially can’t wait until my daughter is home to visit us from teaching in South Korea, we will make these for her. Just lovely, thank you. Glad these were a hit, Jennifer! Tell your son “way to go!” from me (and I hope your husband’s foot heals quickly). My family loved this, now we make them for guests:) worked well with half whole wheat flour. We’ve made these probably 5-6 times already and love them! I used all whole wheat flour each time and they taste great. I’ve made these twice in the past two weeks and everyone liked them very much. I am excited to try these pancakes (especially with the banana and chocolate chips! ), but I was even more excited about the griddle recommendations! My griddle gave out 2 days after this post…so I was glad to have some input from you. I’m excited to try my new BIG griddle! Thanks Mel! Hope you love the griddle, Aubri! We made these last week and they were good! My family still voted your zephyr pancakes as the best but we’ll definitely make these again when I don’t have heavy cream available. Thanks, Mel! I knew these pancakes were getting great reviews, but I had no idea I would love them as much as I did!! Since I had fat free plain yogurt on hand, I subbed it in for the sour cream-still they were unbelievably amazing!!! Adding sliced bananas & choc chips sent this recipe over the top for me, as I didn’t even need to add butter or syrup to mine. (Fam members did add a little butter & syrup.) Knowing now how incredibly yummy these are, esp w banana & choc chips, I would dash to the kitchen if I were you to make these for whatever your next meal (or snack!) is. Hello Mel. Whenever I make pancakes with melted butter (which I love!) when I mix it with the cold dairy it hardens up into lumps. I have thought of melting the butter in the milk so the milk was warm but then I’m worried the eggs will scramble when I add them into the mix. Our house is cold in the mornings and hot pancakes are great … but how does one solve this problem of lumpy butter … or is it not a problem? (p.s. I don’t like oil so don’t want to substitute). Thanks. Hey Mel, it’s usually not a problem as long as the lumps are small. You can get around this by pouring the butter into the dry ingredients and then adding the other wet ingredients. Don’t do this! I tried pouring the melted butter into the dry ingredients last night, then added the wet. I got HUGE lumps of wet buttery flour all in my batter. After using a whisk and potato masher, I eventually had to use my hands to break up the huge lumps. The pancakes were DELICIOUS, though, so totally worth it. My kids INHALED them! I think next time I’ll go back to my old method of warming the wet ingredients if the butter hardens into lumps, then whisking, then adding to dry. I realized today as I was making these pancakes I have an almost identical recipe for waffles that I’ve been making for years. The ratios are slightly different and the waffles include whipped egg whites. My family LOVED these pancakes!!! These are my go-to pancake recipe from now on. I’m not sure why I didn’t think on my own to make our “Fluffy Waffle” recipe into a Fluffy Pancake recipe. Which makes me happy because now I know they’ll make great waffles! 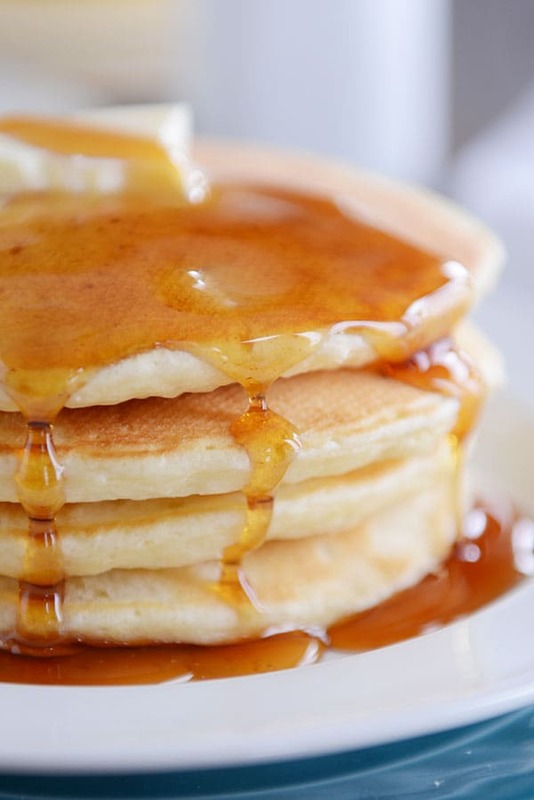 Wow…I do not love pancakes, but I make them all the time because my kids love them. I’ve tried so many recipes and have never found one that I love, but these have changed my mind about pancakes. They are amazing! Thanks for giving me a go-to pancake recipe that I can actually enjoy eating!! That made my day, Kara! So happy you found the one pancake recipe to stick with! We made these for a special Valentine’s brinner tonight. So good! Thanks, Mel! Mel, I made these this morning for a special Valentine’s breakfast for my husband. We agreed they’re the best pancakes we’ve ever eaten. I cooked the extras with the addition of some chocolate and peanut butter chips and wrapped them in plastic wrap for my granddaughter. She had them as an after school snack with a big squirt of whipped cream. Thanks for the wonderful recipe! How thick is this batter supposed to be? Mine is muffin-batter-super thick. I am a regular cook and have been using Mel recipes since 2010 … but this looks just … off. Measured and mixed exactly as recipe instructed. Giving it a few minutes, hope it … does something … otherwise into the trash. ARGH!!! So frustrating. Don’t throw it out! Just add a bit more milk/buttermilk/sour cream until it thins out a little. The batter is definitely considered thick, not thin, so it may be fine. I subbed yogurt for the sour cream and my batter was SUPER thick for the first batch. I thinned it out with milk for the rest but they were all delicious. I made these last night, and they were delicious. My little kids at all of theirs.Also, thanks for mentioning the cookie scoop. It was super useful. Glad to hear it, Whitney! I used greek yogurt in place of the sour cream (it’s what I had on hand!) and they were delicious! Everyone loved them. Funny, I was going to ask Mel if I could sub greek yogurt for the sour cream. I’m glad to know it works out. Thanks! I added just a bit extra milk because the batter was super thick but I’m not sure if it was an original measurement error or the yogurt. Super delicious! Yum, those do look indulgent! But what a great treat to try–I love sour cream in anything. Hoping you had a wonderful birthday celebration and wishing you a year full of more joy and happiness! These are exactly what I was looking for to make a special little pre Valentine breakfast dinner…since mornings are a little crazy at our house! So light and delicious! Hope you had an awesome birthday! We love you so much…you do make us Rock the kitchen and that keeps our families happy! Thanks a bunch! Thanks, Jill – and so happy you loved these little pancakes! If you sub kefir for the sour cream as you mentioned, do you use 1 1/2 cups of kefir, and then an additional 1 1/2 cups of milk? Thank you! I usually add 3 cups of kefir. Thank you! I used the kefir and they turned out delicious! They were a little fragile during the “flipping” stage like you said, but no big deal. The banana and chocolate chip addition you suggested was amazing! I have tried many pancake batter recipes and haven’t found “the one” yet. I only have cake flour and bread flour but no ap..can I use cake flour ? I’m sure bread flour would be too dense. As far as griddles I’m fortunate enough to have a boyfriend that works for a big food company and I’ve taken possession of his portable grill he is supposed to use at food shows and demos. They are the best going from making 3 pancakes at a time in a pan to 12 at once on the grill. Awesome griddle! About cake flour, I’m not sure how 100% cake flour would do. This is just a guess, but I’d probably use 2/3 cake flour and 1/3 bread flour to get the right amount of gluten. My oldest daughter is turning 11 on Friday and asked for pancakes with homemade strawberry raspberry topping for her family party dinner on Saturday! I’m going to make these and add a generous handful of mini chocolate chips to the batter, too! I’m making these right now and subbed whole milk plain yogurt for the sour cream. They look amazing! but you are an amazing cook who shares the best no fail recipes. I hope your birthday was as fabulous as you !’ I LOVE your blog and LOVE your recipes ! Can you sub nonfat plain greek yogurt for the sour cream? I am a sucker for good pancakes. These fluffy little guys look great! Oh, and I totally laughed out loud while reading about your two boys comments during your eat out birthday dinner. Happy late birthday! Do you have a recipe section of all your 30min or less meals? I wanted to share with a friend. I thought I remembered seeing it as a button on the right side once, but maybe my tablet isn’t showing it. I searched the recipe archives but didn’t see one. Thank you! I had never heard of sour cream pancakes until we made them for my roommate in college on her birthday because they were her favorite! They’re super yummy! I’m going to try this out this week! Sounds wonderful, Trying this recipe out today. Do you think I could make the pancakes and freeze for later? Also, can I use this recipe for waffles? Yes, I think these pancakes would freeze very well. I haven’t used the recipe for waffles…but I think I’m going to make heart shaped waffles in the morning with the batter and I’ll report back! I have a banana sour cream pancake recipe that I love; it’s similar to this but you mash the bananas and stir them into the batter. It is my favorite ever, and it works with whole wheat flour too. It’s amazing what that sour cream does to the pancakes! So good! Awesome! Going to try to attempt to make these in heart shapes for tomorrow morning! Wish me luck! Having these for breakfast and your double chocolate mousse torte for dessert. It is going to be a great day! Was just thinking of heart shaped pancakes for tomorrow and this post comes up. #mindreader ps happy birthday!! These look so yummy! 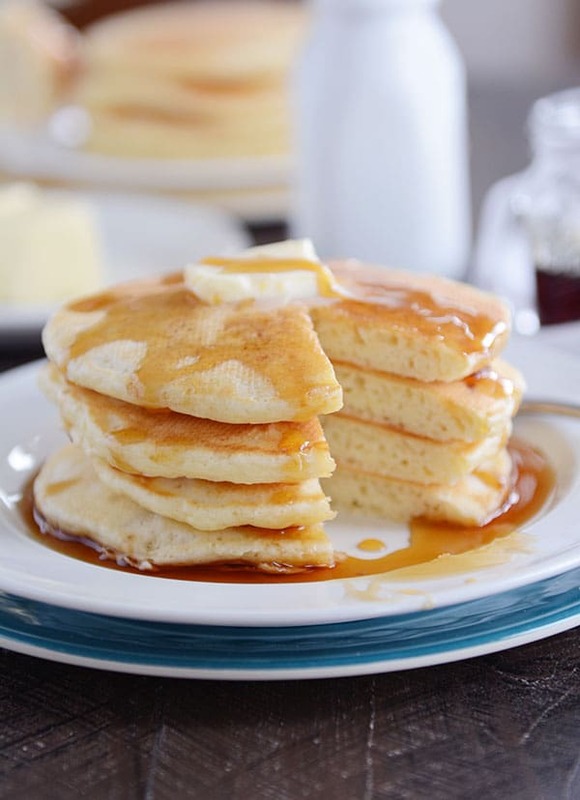 And your dining out experience sounds way too familiar…we try it every once in awhile with our 5 kids and we always leave thinking, “So was that supposed to be fun?” Also, I’m wondering if I could sub yogurt for the sour cream in the pancakes? I’ve subbed yogurt for sour cream and the results are much the same. Glad you get what I’m talking about! As for yogurt, I haven’t tried it, but it probably stands a good chance of working. Like the note I made about sour cream, though, I’d opt for a Greek yogurt that isn’t fat-free, but that’s just me. I have been using sour cream in a variety of dishes lately, mostly with great success.. I will try this recipe for certain.. I use my CI 2 burner griddle for pancakes and love the way they cook up.. The link to the 22″ griddle is pointing to the yummy syrup from Wal-mart. Can you adjust? Sorry about that; just fixed it. Does it need to be full fat sour cream or would low fat sour cream work? Thanks! I’ve made them with both; it’s probably just my imagination, but I think the full fat sour cream makes a yummier pancake (more rich and tender). But I would never go to the store to buy full fat sour cream if I had low fat in my refrigerator, so I’d say use what you have on hand (although I’d caution against using fat free sour cream). These look great! We did our fancy family Valentine dinner yesterday and I was planning on heart-shaped pancakes for dinner on Tuesday. We will give these a try! These look amazing! I think I’ll treat my kids (and myself!) to these for a fun Valentine’s breakfast-for-dinner. They love all variations of pancakes. Made them and my kids loved them! I even managed to make some into heart shapes 🙂 This made a HUGE batch of pancakes!